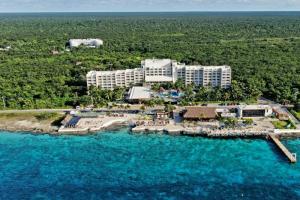 Scuba divers and sun-worshiping families find seclusion and casual comfort at the Fiesta Americana Cozumel All Inclusive resort on the coastal road 15 minutes south of downtown Cozumel. The main scuba diving reefs are just offshore, shortening the boat ride for divers. Non-divers that seek refuge from the bustle of town appreciate the hotel's peaceful location and friendly service. On the sourthern tip of Cozumel, 10 minutes from the airport. Rosato - Fine Dining; El Mexicano - Mexican Cuisine; Peninsula - Asian Cuisine; Cevicheria - Casual Restaurant; Vina del Mar - Self Serve; The Grill - Snack Bar; Tapas; Coffee Corner; Lobby Bar; Beach Bar; Swim Up Bar. Diving, Ecological Tours, Parasailing, Catamaran Cruises, Horseback Riding, Deep Sea Fishing, Chankanaab Park.